This article’s indented audience is people who want to regain some digital privacy but haven’t heard much on the topic before. Right now, all your Facebook messages, all your Google chats, and all your text messages aren’t private. The folks at Facebook and Google almost certainly analyze all your personal messages with robots designed to learn everything they can about you, and your mobile carrier may very well be doing the same with your text messages and phone conversation metadata. In our world, it is imperative that everyone who believes in privacy utilize tools that make this sort of exploitation impossible. In this case, our tool is end to end encryption. We highly recommend you do your own research on this so you understand its significance, but essentially it uses cryptography (cryptography is a branch of applied mathematics) to scramble messages in a way where there is no known way to unscramble the messages unless you have the secret mathematical key (which only the intended recipient should have). In layman’s terms, it makes it extremely difficult for someone to see your messages. Instead of just listening “on the wire” and getting your messages, they would have to hack you, which is significantly harder, more costly, and more time consuming. At present time, the app “Signal” by Open Whisper Systems is the largest adopted open-source end-to-end encrypted messenger available on both the Apple App Store and Google Play Store. This app does all the heavy lifting for you, the only thing you have to do is convince your peers to download it too as you can only communicate with end-to-end encryption with someone else who also has the app. Signal also supports end-to-end encrypted phone and video calls. We have found it extremely easy to convince a large number of the people we know into getting Signal because it is so easy to download and set up. Google Chrome seems to be the most popular web browser. Not only is it closed source, but it is known to collect telemetry data (information about your device, browsing habits, etc) and send it to Google. Firefox is an open-source browser that does not do this. Even better, Brave is a web browser that not only is open source and doesn’t log invasive telemetry data, but also blocks online trackers and advertisements by default. We recommend checking them out. For the most private browsing experience, use the Tor browser, although some websites will not let you view them with TOR. We hope to talk more about Tor in a future blog post. Totally stop using assistants such as Alexa, Siri, Google Assistant (such as “Google Home”), Cortana, etc. There’s really not much else to say about this, just stop using them. Because of the closed-source, cloud-based nature of these products, there is no way to validate whether or not they listen to you and log what you say when you aren’t using them. Until an open source alternative is identified, totally avoid these products. Ever mentioned a product while talking to a friend, and later seen ads for it? One of the apps on your phone likely has permission to your microphone and is listening to everything you say. Applications you install on your phone will likely take advantage to every permission you give them. They’ll use your GPS to track you, your camera to watch you, your contacts list to track the people you associate with, pictures on your phone to gauge your interest, as well as other things in an attempt to learn all they can about you so they can sell your data to advertising agencies or anyone who will pay. Fortunately for you, this exploitation can be mitigated by managing the permissions on your phone, meaning you can prevent apps from accessing your microphone, location, camera, etc. Certain apps will still need specific permissions to function as intended – for example, calls will not work if the phone app doesn’t have access to your microphone. The way you change app permissions is different on each phone and you may have to do some digging to find the appropriate settings screen. Hardening permissions on your mobile device is definitely one of the least straightforward steps to regaining digital privacy, but it is certainly one of the most important. On my android device, I open settings, then tap “Apps & notifications”, then “Advanced”, then “App permissions”. 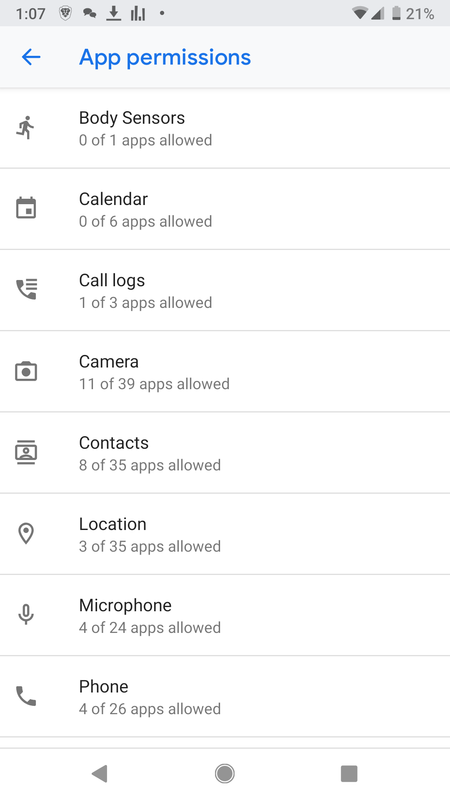 From here I see a category of each permission type and the number of apps that request that permission, as well as the number of apps currently given that permission. See the below screenshot taken from my Android device. I can tap a permission and then manage which apps can have that permission. See the below screenshot. Don’t just deny all permissions, again, some apps clearly need certain permissions to function. 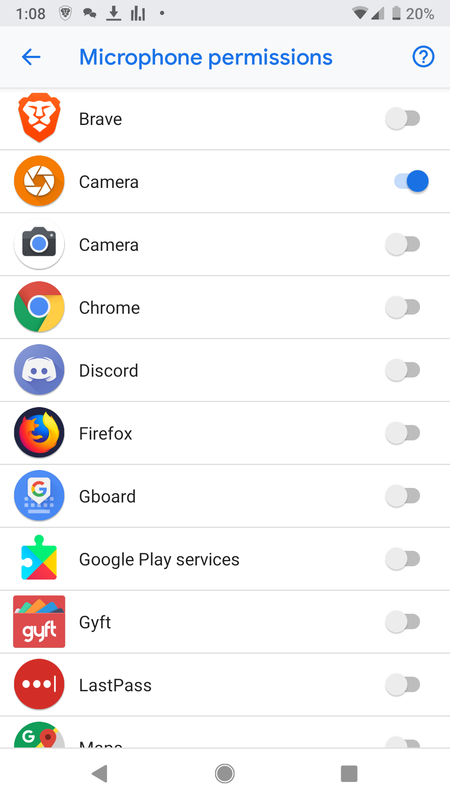 Your camera app needs access to the camera permission in order to take pictures. Your camera app usually also needs access to your microphone so it can take videos. However, your camera app DOES NOT need access to your contacts. Why would it? Also, your camera app will also need access to your storage so that it can save the pictures you take. The rule of thumb here is apps should have the least amount of permissions necessary to serve you. This is generally called the rule of “least permissions” in information security. Please note that apps might stop working the way they are suppose to if you deny the permissions they ask for, you’ll probably have to fiddle around with it. Welcome to Crypto-Armory! Our mission is to introduce freedom-promoting technology to other freedom seekers and to share ideas and services that help to enforce your freedom, while all along contributing to the cryptocurrency ecosystem by offering our assortment of defensive products. At Crypto-Armory, our motto is “Enforce your Freedom.” That is because we know no one is going hand you liberty, especially not the tech giants. Through this blog, we will introduce you to a variety of technologies, services, movements, and some basic knowledge that you can use to enforce your own freedom. Using these technologies, it is possible not to merely advocate for freedom, but to actively enforce it. Rather than asking politely for Google and Facebook to stop spying on you, make it impossible for them to continue. Rather than hoping “Big Brother” isn’t wire-tapping you, easily make it impossible using readily available, convenient, secure communication apps. The technologies are available for you to live freely, you just haven’t been introduced to them yet. Arming you with this knowledge is the purpose of this blog. The foundation of freedom-promoting technologies is the free software movement (https://en.wikipedia.org/wiki/Free_software_movement). For years people have been creating programs that are “open source”. Open source programs can be audited by anyone, allowing anyone to prove that the program functions as intended and does not secretly do any harm. Every piece of these programs are laid bare to anyone who takes the time to look – and many people do. You can rest assured that it is extremely unlikely for any intentional vulnerabilities to have been placed in any software mentioned in this blog. This is as opposed to proprietary software (https://en.wikipedia.org/wiki/Proprietary_software), which is software that is closed source and cannot be audited. There is no way to know whether or not this software spies on you or exploits you in any other way. The foundation that free software (open source software) gives us allows us to build applications we can provably trust. One way that open source technologies can enable us to live freely is by liberating us from the exploitative banking system that has become complicit with the surveillance state and silently steals from us via inflation. Alternative money systems are being experimented with and are experiencing much success. Already several thousand institutions exist which trade using extremely secure digital currency – cryptocurrency. In fact, the only forms of payment accepted at Crypto-Armory are cryptocurrencies. All income from our shop is directly used as money, not sold for fiat (dollars). For us, cryptocurrency is our money, and we have done well finding ways to live off it. One of our next blog posts will describe the various merchants and services we’ve found that allow us to (nearly) live off cryptocurrency. Cryptocurrencies are not controlled by a company, individual, or any other single entity. It is a protocol that, among other things, allows computers to come to agreement on account balances. If you’re not familiar with how cryptocurrency works, try to imagine gambling without chips or physical money. Instead, there is a record of how much everyone started with, with their wins and losses recorded so there’s always a tally of their total funds – but because nobody trusts anyone else, everyone keeps a full record of each other’s ledgers to ensure a fair environment. If someone were to try and cheat, everyone would notice and would not count the faked records. Cryptocurrency operates like a large-scale version of this scenario (although, with more privacy). Anyone can become a “node” and store the full record (called the blockchain). Other factors exist in cryptocurrency which help secure it, such as mining, but we will not get into that here. Cryptocurrencies are distributed, trust-less systems. They allow you to “be your own bank” and know that your funds aren’t being lent to others and will always be available to you. They do not require your personal information, no government prints them, no one can seize them, your funds cannot be frozen, there is no middle-man, and they cannot be counterfeited. You control your coins, and only you. We believe technology is the next great frontier of freedom. Many recognize the dangers technology poses to liberty, but few know of the powerful alternatives that allow us to partake in a peaceful revolution – a turning away from censorship and surveillance and instead towards tools that protect your rights. There is a sleeping giant of people who believe in liberty that is unaware of these alternatives; our blog’s purpose is to awaken that giant by explaining these technologies in plain English and providing clear directions as to how to start using them. We hope that you will join us as we begin revealing these different technologies to you.